It’s all about the airflow! Rabbit ECU controls the fuel flow into your engine by way of first calculating the air mass flow through the intake ports. Dividing this air mass flow rate by the target AFR gives the desired fuel flow rate. 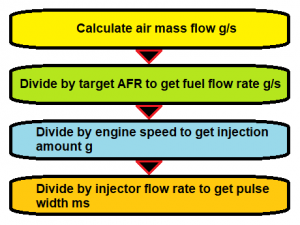 This is in turn divided by engine speed and injector flow rate to give a required fuel injection pulse width. There are two main methods of calculating the air mass flow rate, the so called speed density method, and the direct measurement method. Using the speed density method, a tuned volumetric efficiency (VE) map is used along with the engine speed, a load signal and air temperature to estimate the air mass flow. If engines were perfect, a 2 liter engine would breathe exactly 2 liters of air at wide open throttle each engine cycle. But this isn’t the case of course – pressure drops and turbulence mean that generally less air than the ideal amount will flow. The VE is the measured flow rate divided by the ideal flow rate and is usually in the range of 75-90%. In speed density mode, the Rabbit ECU uses a manifold absolute pressure (MAP) sensor as a load signal. You should use 1 bar MAP sensor for NA applications, and a 2+ bar MAP sensor on turbo engines. The MAP sensor signal, along with the RPM signal, are used to index the tuned VE map so that a precise VE can be known at any load point. The VE map above is tuned so that the AFR measured at the exhaust is roughly equal to the AFR in the target table. An accurately tuned VE map is the basis for accurate fuel flow calculations. 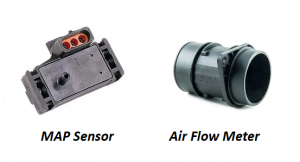 One advantage of a MAP sensor speed density system is that boost is directly measured and can be controlled and limited. Also, MAP sensor systems can cope a lot better with air leaks and the MAP sensor itself is very robust compared to the AMM/AFM. Another way of knowing the mass air flow rate is to measure it directly with an Air Mass Meter (AMM/MAF) or Air Flow Meter (AFM). AMMs are the most common and easy to use flow meter because they give a direct mass flow rate. The older style AFM gives a volume flow rate measurement that must be adjusted for temperature to give a mass flow rate. AFM/AMMs used by the Rabbit ECU can be either 5V analog or digital type. The analog type usually has a voltage output that rises with more airflow. Similarly, the digital type has a frequency output that rises with more airflow. Analog signals can be wired to ANALOG1-8 and a digital signal can be wired to the CAM+ signal. 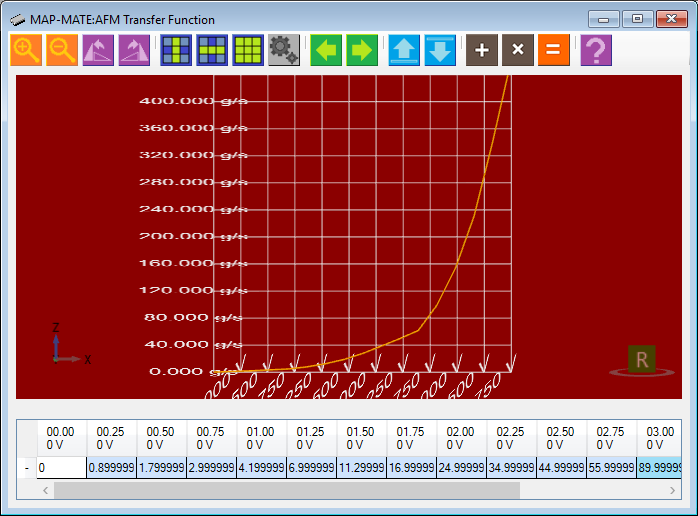 The relationship between signal and mass flow rate must be programmed into the AFM Transfer Function table of the Rabbit ECU. One big advantage of using direct measurement of airflow is that it can cope with changes to VE that come about in variable cam engines. It is very difficult to adjust for changes in VE as the cam advances and retards in a MAP sensor only system. Also there is little need to re-tune after an exhaust or intake change that almost certainly affects the VE. There are a few settings that control how the Rabbit ECU calculates air mass rate. The other settings are all described in the Rabbit ECU User Guide. 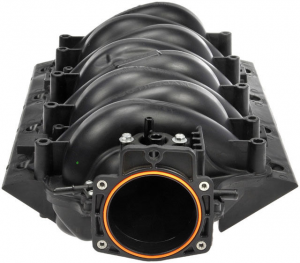 Rabbit ECU can work in either Speed Density or Direct Measurement of airflow mode. It can also be programmed to work with a mix of both depending on throttle position.